Darcell Apelu, Sione Faletau, Terry Faleono, Janet Lilo, Natasha Matila-Smith, Atapana Meleisea, Caleb Satele, Talia Smith, Linda T, Salome Tanuvasa, and Cora-Allan Wickliffe. Offstage is Tautai Contemporary Pacific Arts Trust’s annual moving image and live performance event. 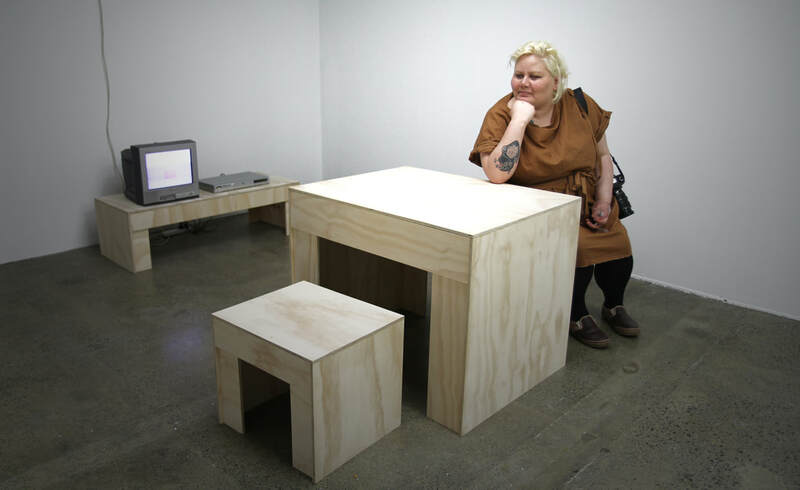 “Brutalist style tv table” exposed plywood “Brutalist style table and stools” exposed plywood, “Pink Milk” Video, 1min38sec.